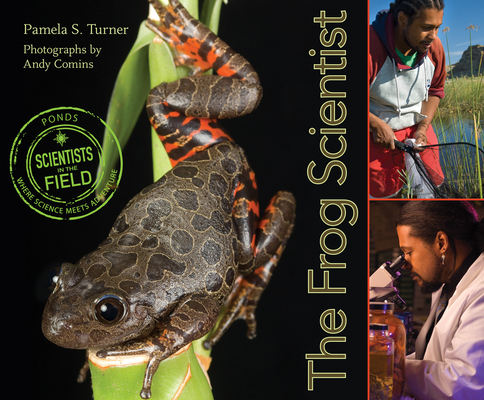 The critically acclaimed Scientist in the Field book about how one boy’s interest in backyard science inspired a career in scientific discovery. When Tyrone Hayes was growing up in South Carolina, he didn’t worry about pesticides. He just liked to collect frogs. Tyrone’s interest in science led him to Harvard University, and though he struggled at first, he found his calling in the research lab of an amphibian scientist. Meanwhile, scientists discovered that all around the globe, frogs were dying. The decline has many causes, including habitat loss and disease. Tyrone discovered that the most commonly used pesticide in the United States, atrazine, may also play a role. Tyrone tested atrazine on frogs in his lab at Berkeley. He found that the chemical caused some of the male frogs to develop into bizarre half-male, half-female frogs. What was going on? That’s what Tyrone wants to find out. Andy Comins is a California photographer who specializes in portraiture and children's photography. His books include The Frog Scientist and Stronger Than Steel. Pamela S. Turner has a master’s degree in public health from the University of California, Berkeley, and a special interest in microbiology and epidemiology. Her articles for children and adults have appeared in numerous scientific publications. Her books include Hachiko: The True Story of a Loyal Dog, Gorilla Doctors, The Frog Scientist, Dolphins of Shark Bay, and Project Seahorse. She lives in California.